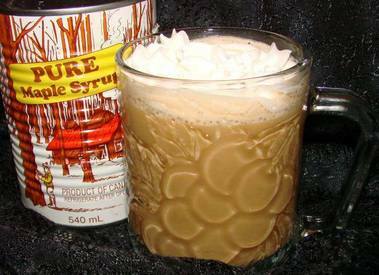 Today is National Maple Syrup Day, giving you the perfect excuse to try this delicious Maple Cream Coffee!! This makes a delicious very light and sweet cup of coffee. I had this for breakfast this morning but left out the whipped cream. Tastes like a maple nut candy bar. I think this would make a nice nonalcoholic after dinner drink too. In small saucepan, cook and stir cream and syrup over medium heat until heated through (do not boil). Divide evenly between two cups.